Chinese Wall - What Does It Mean? What is a "Chinese Wall" as it applies to an investment firm? 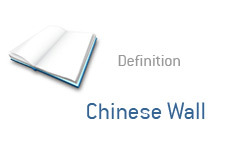 What is the definition of a "Chinese Wall"? I'm sure that you are familiar with the "Great Wall of China", which is a wall (in China, of course) that stretches for over 5,500 miles. Now, imagine having a wall inside an investment firm. The purpose of the wall? To stop sensitive information from flowing from one department to another. A firm doesn't want people from the investment banking department talking with traders on the floor. Does a firm want Joe from Investment Banking blabbing to Mike on the trading floor about the deals that he is currently working on? Not a chance, as Mike might use this information to gain an edge, which may ultimately get the firm into trouble. Also, it's not fair to the firm's investment clients if everyone at the firm is privy to the confidential information. For this reason, firms will construct proverbial "Chinese walls" that seek to restrict the flow of information from one department to another. Are these Chinese walls actually effective? That's another question altogether.